Princeton City Hall is located at 100 Courthouse Road, Princeton, WV 24740; phone: 304-487-5020. Photo: Dr. Robert B. McNutt House, ca. 1840, 1522 North Walker Street, Princeton, WV. Listed on the National Register of Historic Places in 2001. Photographed by user:Coal town guy, 2014, (own work) [cc-by-3.0 (creativecommons.org/licenses/by/3.0)], via Wikimedia Commons, accessed January, 2016. Princeton, the county seat, was settled in 1826 but the village government was not organized until 1837. Princeton was named for General Hugh Mercer who was killed in battle in Princeton, New Jersey. 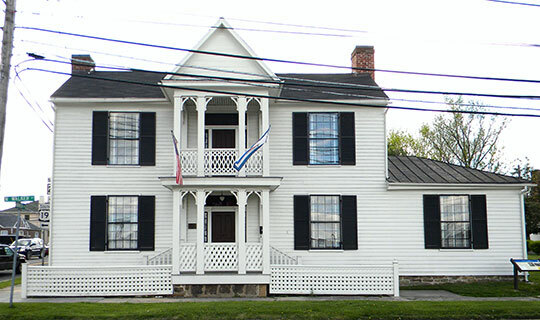 The first post office in Princeton was organized in 1838. By 1860 Princeton had forty houses and two hotels. The entire town was burned in 1862 when retreating Confederates fired the courthouse and the town. Princeton began to rebuild itself. In 1865 a five year battle between Princeton and Athens began for the location of the county seat. It was decided by a special election in 1870 that Princeton would be the county seat. The first bank in the county and in Princeton was organized in 1851 under the name Princeton Saving Bank. Dr. Robert B. McNutt was the President, and Alexander M. Mahood was the cashier. Dr. McNutt was also the first resident doctor in Princeton. In 1855 the Methodists and Baptists built a united church on Main Street. This was the first church in Princeton. In 1874 a bank was organized by H.W. Straley to serve the areas farmers. The safe was a trunk and coins were kept in a beaver hat. It is said that Frank James, brother of Jesse James, cased the bank but rejected it because it was so insignificant that to rob it would be a reflection on his prowess. Princeton slowly grew after it became the county seat in 1870. Two hotels were rebuilt, The Alvis and The Pearis. The Bank of Princeton was chartered in 1872. This was the only bank between Charleston, West Virginia and Bristol, Tennessee at the time. In the 1870's, Captain John Smith and Captain Hercules Scott operated two stores in town. John Darst, who also operated a tanyard, was granted a license to open a hotel. It became known as the Perkins Hotel after 1900. James Hale was issued a license in 1879 as a druggist. Also in 1879. George W. Anderson and Mr. Foster began printing the first newspaper in the county, The Princeton Journal. Shortly afterwards, Dr. R. B. McNutt along with several others started The Greenback Banner. There were numerous newspapers established in Princeton. The Princeton Journal was the first in 1879 and it was followed by the first daily the Evening Press in 1916; the Princeton Progress in 1912; the Mountain State Sentinel in 1916; the Princeton Observer in 1927; the Princeton News in 1931; and the Princeton Times in 1961. The Princeton Times is the only operational newspaper today. Churches in Princeton continued to grow. The united church split by 1885 and the Baptists built a church where the Memorial Building now stands. The Presbyterians built a church in 1879 on North Walker Street. A year later the Episcopal congregation built a church on Mercer Street. With the arrival in the mid 1880's of the Norfolk and Western Railroad, Princeton began to experience business expansion. The first baseball team was organized in 1884. A hack service for freight and passengers was started. Several new stores were opened. In 1894, Bluefield began to agitate to be the county seat but this was quickly quelled. By 1900, Princeton had a population of about five hundred and two main streets, Walker and Main Streets. The Virginian Railway began surveying in 1905 for a right-of-way through Princeton from Norfolk, Virginia to Deepwater, West Virginia. Again, Bluefield collected signatures on a petition to force a special election to determine the location of the county seat. Princeton again won the seat and the ordeal came to an end. With the coming of the railroad, Princeton began to boom. As the population increased, so did the need for utilities. In February 1907 an individual was granted a fifty year franchise to provide electricity to Princeton. In November of the same year, M. Cook of Hinton was also granted a fifty year franchise to provide water to the city. Two large businesses were established in 1908. The first was the Majestic Steam Laundry, headed by B. Deyerle, opened on Harris Street. The first automobile in Princeton was used as a taxi between Princeton and Bluefield in 1909. The Princeton Power Company operated the first street car in 1909 and it ran from the Courthouse to the Virginian Depot. This street car business operated until September 1940. Sam Evans established an interurban car between Princeton and Bluefield in 1916 and it remained in operation until April 1947. Modern day State Route 20 was the original right-of-way for the interurban line. The appearance of a bus garage in the late-1940s or early 1950s, continued the neighborhood's role as a transportation hub into the mid-twentieth century. The Virginia Railway was completed to Deepwater, WV in 1909 and Princeton's development began moving towards the depot at the end of Mercer Street. Prior to this, Mercer Street had been known as Concord Road. Stores, hotels, and restaurants began lining the road to the depot which was located at the end of Mercer Street on the east side of North First Street. HH Ball and HC Hadden opened clothing stores on Mercer Street. In this same time period, 1909-1910, the Pioneer Coal Company, the oldest coal dealer in Princeton was established by TH Teel. Princeton continued to grow. On February 20, 1909, the name was changed from the Town of Princeton to the City of Princeton. By 1910 Princeton's population had doubled to one thousand. The Christ Church, the Methodists, the Baptists and the Presbyterians all relocated their churches to Mercer Street or just off Mercer Street in the case of Christ Church. The populace voted to pave the streets and install a sewage system in 1912. Michael Gioulis, Historic Preservation Consultant, Mercer Street Historic District, Mercer County, West Virginia, nomination document, 2002, National Park Service, National Register of Historic Places, Washington, D.C.